With human H7N9 cases starting to pick up again in China, another epidemic of H5N1 expected again this year in Egypt, and a bevy of new `novel’ flu viruses entering the fray (H5N6, H6N1, H10N8, etc.) the concurrent peak of seasonal flu is viewed by many scientists as a potential flashpoint for influenza reassortment. Reassortment occurs when one virus swaps out chunks of their genetic code with gene segments from another virus. This is also known as Antigenic Shift. Shift can produce abrupt, dramatic, and sometimes pandemic inducing changes to the virus (see NIAID Video: How Influenza Pandemics Occur). Most reassortant viruses are evolutionary failures, unable to compete with more biologically `fit’ wild viruses. Successful reassortment is relatively rare, but as any virologist will tell you . . .
And as the number of novel viruses making forays into the human population increases, so does the likelihood of a `collision’ between a humanized seasonal flu virus and an avian or swine virus. While probably a rare occurrence, with an even lower likelihood of producing a new, easily transmittable virus – the risk is not zero – as Hong Kong’s CHP Director Dr. Ko Wing-man warned last year. All of which bring us to a recently published report on a human influenza co-infection between seasonal H3N2 and H1N1pdm09 which led to a new, reassortant H3N2 virus. The gist is in the abstract, but the details may be found in the open-access text of the report. When you return I’ll have more. Natural co-infection of influenza A/H3N2 and A/H1N1pdm09 viruses resulting in a reassortant A/H3N2 virus. Rith S1, Chin S2, Sar B3, Y P1, Horm SV1, Ly S4, Buchy P1, Dussart P1, Horwood PF5. •A co-infection between influenza A/H3N2 and A/H1N1pdm09 was detected from a patient. •A reassortant A/H3N2 virus was isolated with a NS1 gene from A/H1N1pdm09. •The reassortant virus was viable and able to replicate in cell culture. Despite annual co-circulation of different subtypes of seasonal influenza, co-infections between different viruses are rarely detected. These co-infections can result in the emergence of reassortant progeny. We document the detection of an influenza co-infection, between influenza A/H3N2 with A/H1N1pdm09 viruses, which occurred in a 3 year old male in Cambodia during April 2014. 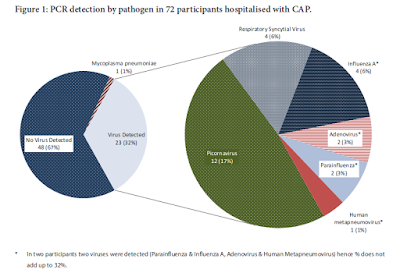 Both viruses were detected in the patient at relatively high viral loads (as determined by real-time RT-PCR CT values), which is unusual for influenza co-infections. As reassortment can occur between co-infected influenza A strains we isolated plaque purified clonal viral populations from the clinical material of the patient infected with A/H3N2 and A/H1N1pdm09. Complete genome sequences were completed for 7 clonal viruses to determine if any reassorted viruses were generated during the influenza virus co-infection. Although most of the viral sequences were consistent with wild-type A/H3N2 or A/H1N1pdm09, one reassortant A/H3N2 virus was isolated which contained an A/H1N1pdm09 NS1 gene fragment. The reassortant virus was viable and able to infect cells, as judged by successful passage in MDCK cells, achieving a TCID50 of 104/ml at passage number two. There is no evidence that the reassortant virus was transmitted further. The co-infection occurred during a period when co-circulation of A/H3N2 and A/H1N1pdm09 was detected in Cambodia. It is unclear how often influenza co-infections occur, but laboratories should consider influenza co-infections during routine surveillance activities. If this study sounds vaguely familiar, it is because back in 2011 we saw a similar story out of Cambodia (see An Influenza Double Whammy), where we looked at a study in the American Journal of Tropical Medicine & Hygiene called. This incident confirms dual influenza virus infections and highlights the risk of zoonotic and seasonal influenza viruses to coinfect and possibly, reassort where they cocirculate. Also from 2011, we saw a similar co-infection in Canada that led to the creation of a unique hybrid reassorted virus (see Webinar: pH1N1 – H3N2 A Novel Influenza Reassortment). In this case, the patient was a 16-month old boy from the Greater Toronto Area who was admitted briefly to a local hospital for respiratory and gastrointestinal symptoms in January. The child was sent home, and recovered without incident, and no other family members or contacts reported flu-like symptoms. It wasn’t until later, when viral cultures showed a hybrid (reassorted) H1N1-H3N2 virus, did scientists realize that something unusual had occurred. And in September of 2011 we saw research (see Study: Reassorted H1N1-H5N1 Produced Virulent Strain) where a laboratory-created reassortant virus with genes taken from the H5N1 and H1N1 virus produced a highly transmissible and virulent strain. In 2010, in EID Journal: Co-Infection By Influenza Strains, I wrote about a study in New Zealand during the opening months of the 2009 pandemic that discovered at least 11 co-infections (out of 1,044 samples tested) with the older seasonal H1N1 virus and the newly emergent pandemic H1N1 virus. Co-circulation of influenza A(H5N1) and seasonal influenza viruses among humans and animals could lead to co-infections, reassortment, and emergence of novel viruses with pandemic potential. Previously, in the Lancet: Coinfection With H7N9 & H3N2, we saw the first evidence of co-infection with the newly emerged H7N9 virus and a seasonal flu virus in a human. While in October of last year, in EID Journal: Human Co-Infection with Avian and Seasonal Influenza Viruses, China, we looked at co-infections in 2 patients in Hangzhou, in January 2014. In all of three of these cases, no reassortant virus was detected. While most of these reassortant viruses are doomed to end up in the influenza’s dustbin of forgotten field experiments, unable to thrive or compete with other viruses, the reality is it only takes one lucky roll of the evolutionary dice to change the flu landscape for years to come.